RESEARCH TRIANGLE PARK, N.C., Apr. 19 /CSRwire/ - The Soil Health Institute is pleased to announce that Robert Foster, a dairy farmer and co-founder of Vermont Natural Ag Products, and Greg Ruehle, the Chief Executive Officer of Servi-Tech, will join its Board of Directors. 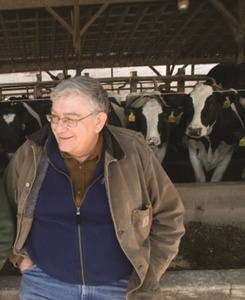 Foster is a fourth-generation dairy producer who received his undergraduate and Masters degrees from University of Vermont in agricultural engineering and agricultural economics. Foster and his family manage a thriving 1,800 acre farm near Middlebury, VT.
As regional innovators, the Fosters were pioneers of Cow Power. By converting methane gas from manure into electrical energy, they have become almost electrical-energy independent. The Foster Brothers Farm also has developed one of the largest compost companies in New England. They gather residual nutrients from area farms, process manure for use as fertilizer, blend the different formulas together, and distribute the resulting product as fertilizer and soil amendments through their company, Vermont Natural Ag Products. Foster is a seasoned Board member having served on the Cabot Cheese Board of Directors for 37 consecutive years. Ruehle leads the nation’s largest independent agronomic firm and oversees crop consulting on almost a million acres of U.S. farmland. Additionally, he directs three laboratory locations (Dodge City, Kan., Hastings, Neb. and Amarillo, Tex.) that evaluate nearly a half-million soil, livestock feed and environmental samples annually. Earlier in his career, Ruehle served as CEO for the Independent Professional Seed Association and Executive Vice President of Nebraska Cattlemen after serving the National Cattlemen’s Association (now National Cattlemen’s Beef Association) as Director of Private Lands, Water and Environment in the Washington, DC government affairs office. Ruehle represented the association before Congress, Federal agencies and the Administration on a range of environmental and natural resource policy areas. Foster and Ruehle join respected agriculture and conservation leaders as members of the Institute’s Board, including traditional and organic farmers, scientists, and executives from across the agricultural industry.